IMA Active’s latest technology for film and sugar processes installed in Delpharm’s site in Gaillard, France. 100% management owned, 500 million Euros in turnover, a European Top 5 company with 3,200 employees. 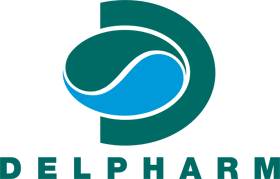 These are the numbers for Delpharm, an innovative Contract Development & Manufacturing Organization of licensed products, generics, OTC products, dietary supplements, veterinary products, medical devices, highly active and injectable products. Beyond the numbers, a vision. Research for quality and compliance with the most restrictive standards characterize Delpharm’s production: tablets, capsules, granules and powders, packaged in sachets, sticks, blisters, tubes and bottles, produced in 12 sites all over the world. In fact, in its 30-years history, Delpharm has grown through the acquisition of plants from major big pharmas. With more than 600 million units produced per year, Delpharm is now among the key drug manufacturers in Europe, by size as per efficiency. All the more, Delpharm is fully dedicated to pharma services for others: 100% of the turnover is for manufacturing and development for its customers. Priority is always given to customers: quality, service and cost are Delpharm’s pillars. In consequence, productivity, responsiveness and flexibility are a constant focus of the Group’s industrial sites, taking into account demanding quality criteria. Constantly looking for innovative solutions, the Group has more than 90 experts dedicated to the successful production of pharmaceuticals. Delpharm’s knowledge of industrial constraints from the start of the development enables the Group to manufacture the products under optimized conditions, thus participating to their success. Delpharm offers complete development from the sourcing of the API to the registration phase, including packaging development and regulatory support. To respond to a wide variety of manufacturing, Delpharm has equipped its plants with top-level technologies for solid dose processing. It is in this context that the installation of Effecta took place, IMA Active’s perforated pan for film and sugar coating. 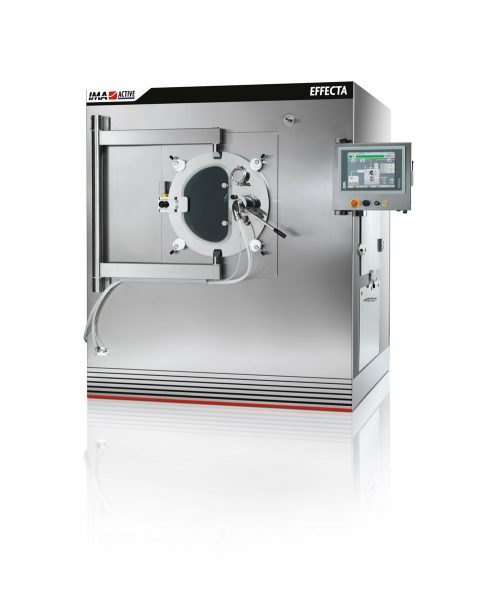 Effecta is the latest technology for film and sugar processes designed by IMA. The key feature in a coating process is the mixing efficiency. Combined with effective spraying and drying systems, an efficient mixing capability uniformly distributes the solution on the cores, minimizing the losses of coating and the contamination of the coating pan. It is following this concept that IMA Active designed Effecta: the shape of the pan combined with the mixing baffles positioned on the central sector of the drum ensures excellent mixing and uniform distribution of the sprayed coating dispersion. The spray guns are positioned over the product and fixed on the support arm. Fine atomization spray is delivered to achieve proper finishing of the cores. Effecta can be supplied with interchangeable spray guns for either a film or sugar process. The dosing unit is complete with a peristaltic pump and a volumetric dosing system depending on the coating process. Effecta can be equipped with an automatic washing system: the cleaning sequence is optimized as it is divided in different steps to minimize water consumption and washing time. Water discharge is carried out by means of a valve placed on the bottom part of the pan. Finally, a drying phase is performed by using filtered process air. All the processes are managed and controlled automatically by means of the XIMA HMI. A complete database of automatic recipes for film, sugar and washing can be stored in the PC and recalled when necessary. The key point in a coating process is the efficiency of the mixing technology used in the coater. Combined with a high performing drying system, efficient mixing allows distribution of the coating on the tablets uniformly, while minimizing coating losses. This also helps in minimizing coater contamination that leads to faster cleaning and optimization of downtime between one product and another. In particular, for a contract manufacturer it is very important to select equipment feasible for all types of coating with the ability to manage different processes. This was a key point for Delpharm in the early stage of the equipment selection: for this reason, many tests were carried out to stress the coater performances. Tablets were first coated with small quantity of polymer in water by using a lab scale machine for preliminary run. A small batch was used to check feasibility of a small weight gain coating, which was run successfully. To demonstrate the good scale-up ability of the coater, tests with bigger batch of tablets (ratio 1:10) were conducted in triplicate on Effecta 200, with reproducible parameters. To test the multi-purpose capabilities of the equipment in study, Delpharm tested at IMA Active Process Laboratory the same tablets with different polymer types: the results led to optimal coating quality and performances in all of the tests. This demonstrated that Effecta is the best choice in terms of flexibility and ability to process different products with a wide range of coating formulations.